This 14 days trek begins with an "eye opening" flight to Lukla at 9,200 feet. The trek passes through the picturesque Sherpa village of Namche Bazaar, Thengobche, Dingboche and to Gorak Shep culminating in the "ascent" of Kala Pattar (18,000 ft.) from where classic views of Everest and its surrounding peaks are available. Most of the trek is spent above altitudes of 9,800 ft. in the Khumbu region whose skylines is dominated by the massive peaks of the Eastern Himalaya. 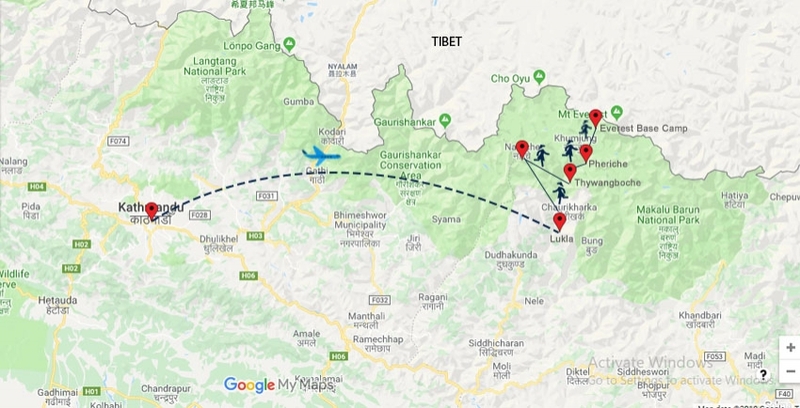 Besides the trek, you also ahe 4 days in Kathmandu, (2 days before and 2 days after the trek), so you can prepare for trekking before the trek, as well as cushion day at the end in case of if the flight delays from Lukla to Kathmandu. Day 16 Fly Lukla - Kahtmandu and tranfer to hotel. Day 17 At leisure in Kathmandu. Upon arrival in Kathmandu a Third Eye Travel's representative will meet you at the airport and transfer you to your Hotel. Free day in Kathmandu to make the final preparations for your trek or do some exploring on your own. We will be happy to arrange sightseeing tours of the valley for you if you desire. Please ask for this service with our airport representative upon arrival. Early morning transfer to airport for flight to Lukla. The flight into Lukla is a lifetime experience, in itself. The airfield on a slope and the difference between the two ends of the runway is about 195 feet! Meet with your sirdar and the rest of the crew. You will need to identify your luggage which is to be made into loads, and the Sirdat will load these onto pack animals or get it ready for your team of porters. After lunch trek for a few hours along the Dudh Kosi river to the village of Phakding at 9200 ft. The trail continues north up the Dudh Kosi valley to Jorsale, where the trail officially enters the Sagarmatha National Park. There is an entrance station just beyond the village where trekking permits are checked. Continue along the trail, crossing the Bhote Kosi River to begin the steep climb up to Namche Bazaar at 11,500 ft., the administrative center of the Sagarmatha National Park and the hub of Sherpa society. Remember to look out for glimpses of Mt. Everest from the trail on the way to Everest. A moderately easy and beautiful walk to the village of Thame 12,500 feet., situated at an important junction along the old primary trade route to and from Tibet via the Nangpa La (pass). The trail leads west past a large array of prayer flags and Mani stones - some of them very picturesque. After the village of Thomde the trail descends to the river and makes a steep climb to Thame, about 4 hours from Namche. Morning visit to Thame Monastery, then trek to the serene Sherpa village of Khunde and Khumjung. This morning the trail leads past the large Sherpa settlement of Khumjung and then descends deep into the Dudh Kosi Valley at Pungki Thanka. The trail then ascends the right flank of the Dudh Kosi valley to Thyangboche at 12500 feet, home to the famous Thengboche Monastery, spiritual center of the Khumbu. The climb is long but, more than adequately compensated by views of Mt. Amadablam and on clear days views of Mt. Everest and it surrounding peaks. Amadablam means "Mother's Charm Box" and is named after the little box that Sherpa women wear around their necks. It is also one of the most beautiful mountains in the Himalaya. Descend through a beautiful forest then cross the Imja Khola and trek through the village of Pangboche. The route continues through summer pastures to Dingboche. This day will be spent acclimatizing. You can spend the day doing laundry or you can take a short hike to Chukkung Valley. This valley is a summer pasture and contains a temporary settlement for herders of the Khumbu and is at 14,400 ft. The views from Chukkung and beyond are tremendous. Trek along a broad valley floor to Dughla, leaving behind the Trekkers Aid Post at Pheriche 13,900 ft. A western volunteer doctor, supported by The Himalayan Rescue Association is stationed here and offers treatment and consultation to trekkers. Continue up the valley gaining altitude. Come out of the valley to descend to the yak pastures at Lobuche. After a short climb through meadows, look down on the Khumbu Glacier. Straight ahead is Kalapattar - the best vantage point to view the entire south face of Mt. Everest and the surrounding peaks. Trek to Gorakshep and prepare for tomorrow's ascent of Kalapattar at 18,187 ft. If the weather is good, just hike to Kalapattar in the afternoon. You don't want to miss the opportunity, since you won't know tomorrow's weather. If the weather is not good, then you may like to to hike to Everest Base Camp. The Base Camp is usually used by expedition teams and you don't see the Everest from from Base Camp. Overnight at Lodge in Ghorakshep. This morning, those who are able will hike up Kala Pattar for unobstructed views of Everest and its surrounding peaks. Most of the famous photographs of Everest were taken from atop this "bump" on the landscape. In the afternoon, retrace your steps to Lobuche. Follow the main Khumbu Valley down to Pheriche, site of the Himalayan Rescue Association's Trekkers' Aid Post. Easy walk along the Imja Khola with a visit to the gompa at Pangboche, then a short climb up to the Thengboche Monastery. The trail descends steeply towards Pungki Thanka and another steep climb to Namche Bazaar. flight to Kathmandu. Weather permitting your trekking crew might prepare a farewell treat for you. Fly Lukla Kathmandu. You will be met at the Kathmandu airport and transferred to hotel. At leisure in Kathmandu. You may like to take an optional tour in and around Kathmandu. Transfer to airport and fly to U.S. or an extend your trip to Bhutan, India or Myanmar or other destinations in Asia. Trek Permit and National Park Fee. Expenses that are not specified. Yes, you need a visa for Nepal which you can get upon arrival in Kathmandu airport. The trek permit and national park entrance fees are included in the tour. Spring & Fall are the best time to travel to Nepal. The weather generally stays nice and sunny, and the the chance of rain is very low during the time, and the views are usually pretty good during the time. However, it will be chilly specially at night during the trek. So, you must have a good down sleeping bag for this trek. Our groups are usually small, so you get the personalized services from trekking guide. There must be minimum of 2 people to run the trip and the maximum is 10 people in the group. This is a strenuous trek. Once you fly to Lukla, you will be above 10,000 ft. most of the time. You will be trekking about 6-8 hours ups and downs a day. Though you do not need any technical climb, you must physically and mentally be fit to do this trek. Trekking above 10,000 ft. may cause altitude sickness for some. We recommend you to consult with your physician who may recommend altitude medications as well or give you other suggestions. We strongly recommend you to carry travel insurance which protects you, in case of emergency evacuation or cancel the trip or other reasons like flight delay, flight cancellation. Once you book the trip, we can send you a Travel Insurance Quote. You can either buy through the link we send you or from your choice of other insurance companies. You will be staying in a comfortable accommodation with attached bath in Kathmandu. Your breakfast is always included in Kathmandu . While on the trek Lunch and dinner are included as well. You will be staying in Lodge while you are on the trek. If you like to upgrade the hotel in Kathmandu to higher end hotels, that is also possible with additional price. What about trekking guide and porters? We provide an experienced trekking guide, who hires reliable porters for trekking They will carry all your load including your sleeping bags. You just need to carry a small day pack bag with water bottler, camera and a sweater or jacket during the day time. We will email you a packing list once you book the trip with us. We mail you the final information packet 2-3 months prior to departure. You will find the all relevant information including confirmed hotel, local contact details, domestic flight info, and packing list as well. Yes, you can extend your trip to Bhutan, India, Thailand, Myanmar or destinations in Asia. You may like to inform this at the time of booking the trip, should you book the international flight with us. We would be happy to arrange your extension as well.